If you’ve chosen to move forward with dental implant supported tooth replacement, you likely know the most commonly asked questions about this restoration method. If you’re just starting to consider this option, you are probably asking it right now. How much will this cost? While most patients find the response frustrating, the only way to answer honestly is to say that the overall price varies dramatically from patient to patient. 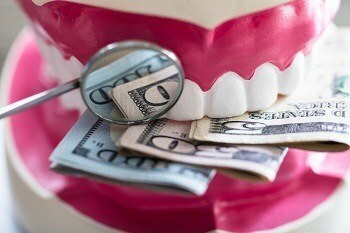 If you are a patient of Mark Givan, DDS and his Fort Worth dental team, you can rest assured that we will offer you an accurate and fair price estimate specific to your unique case. However, on this page, you’ll find some information about average pricing and how our caring team can help you fit implant retained tooth replacement into your budget. Give our team a call to schedule a dental implant consultation today, if you want to get started down the road to a healthy, beautiful smile. Unfortunately, the vast majority of dental insurance providers do not currently cover dental implants. However, as more and more dentists are recommending dental implant tooth replacement as the ideal solution, providers are slowly starting to include these procedures. Luckily, most providers will still offer coverage for your preparatory procedures, dental sedation, and your replacement teeth. This is an immense help in planning for the overall cost of your treatment. We are happy to work with patients to help them fit the cost of implant supported tooth replacement into their budgets. To start, we will not bill for the entire treatment process at one time. Instead, we will bill each phase of treatment separately. This will allow you to plan ahead and save between treatment visits. We are also happy to work with third part medical and dental financing companies like CareCredit. These third party financiers offer low and no interest payment plans for patients who need to cover the cost of advanced procedures. If you have a flexible spending account (FSA) or health savings account (HSA), these funds can often be put toward covering the cost of your implant supported tooth replacement plan.